Kick off your summer with an afternoon of bluegrass in the park. Bring a blanket, grab a beer, and get ready for some top-notch performances—or join the jam and show off your own skills! 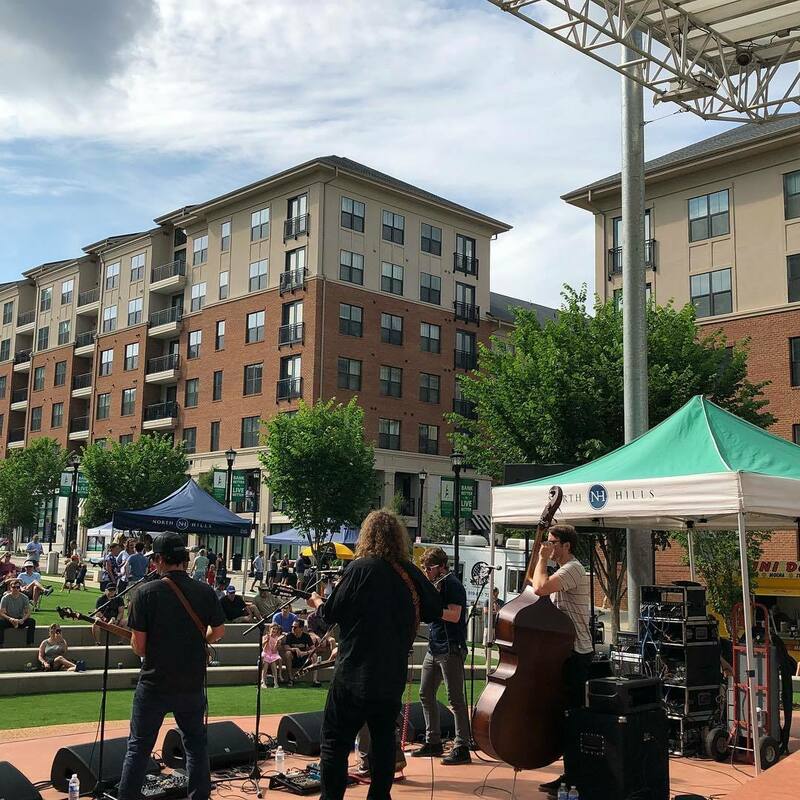 "The newly sanctioned IBMA Midtown Bluegrass Series, in partnership with PineCone, appeals to young and old alike, featuring the best of bluegrass with popular string band music. With its unique combination of gospel, country and blues, that iconic “high lonesome sound” has deep rooted ties to the Appalachian region of the Tarheel state. Beginning with youth jam sessions, these family-friendly bluegrass events are as feel-good as it gets. Bring a blanket and a football, buy a beer and an ice cream cone, and listen to some top-notch bluegrass music in the park. Jam Session – If you play guitar, bass, mandolin, fiddle, or banjo, or even if you don’t play an instrument and you just want to sing along, this jam is for you! Starting at 2 p.m., join PineCone for a pre-show bluegrass jam – participants of all ages and abilities are welcome. This month's jam facilitator is Russell Johnson, an award winning singer and songwriter who has performed in multiple bands throughout his career, including his current band, Diamond Creek. He has worn several different hats in the music business: singer, songwriter, producer, mandolinist, recording and sound engineer, band leader, and record label and studio owner. He is also the director of the Carolina Bluegrass Band at UNC-Chapel Hill. At a time when most people feel constantly distracted by technology and barraged by the news, authenticity and straightforward honesty are paramount. There’s something about the music of The Po’ Ramblin’ Boys that cuts right through the noise of the world and speaks plainly to the soul. Formed in the Smoky Mountains, The Po’ Ramblin’ Boys are at once exactly what you would expect and not at all what you would expect from a tattooed East Tennessee bluegrass outfit. No strangers to hard work, the boys are as much at home riding in their 1965 GM Tour bus as they are crawling underneath to fix it when it needs maintenance. They take pride in being ambassadors of their genre, and the group has brought their music from rural bluegrass festival stages to the rock clubs of Europe, with stunning results. Material for the group’s debut album Back To The Mountains was a combination of original songs and old numbers that honor the group’s mentors and bluegrass heroes. The Po’ Ramblin’ Boys’ passion for bluegrass is as clear as it is contagious. With a heavy touring schedule across the United States and Europe and recently signed record deal with the esteemed Rounder Records, the Boys are well on their way to becoming the quintessential bluegrass band of their generation. Despite all of their recent success, they maintain a humble perspective. The band members are CJ Lewandowski (mandolin), Jereme Brown (banjo), Josh Rinkel (guitar), and Jasper Lorentzen (bass). A great band is more than the proverbial sum of its parts, and in the pursuit of becoming something that can cut through the clutter of YouTube stars and contest show runner-ups, a great roots music band must become a way of life. Less likely to rely on production or image, they’ve got to connect with their audience only through the craftsmanship of their songs, the energy they channel on the stage and the story that brings them together. Old Salt Union is a string band founded by a horticulturist, cultivated by classically trained musicians, and fueled by a vocalist/bass player who is also a hip-hop producer with a fondness for the Four Freshmen. It is this collision of styles and musical vocabularies that informs their fresh approach to bluegrass and gives them an electric live performance vibe that seems to pull more from Vaudeville than the front porch. In 2015 they won the FreshGrass Band contest and found the perfect collaborator in Compass Records co-founder and GRAMMY winning banjoist and composer Alison Brown, whose attention to detail and high standards pushed the group to develop into the foundation of something truly compelling in the roots music landscape. John Brighton (violin), Jesse Farrar (lead vocals, bass), Justin Wallace (mandolin), Ryan Murphey (banjo), and Graham Curry (guitar) combine their diverse musical backgrounds with pop melodies and harmonies into a coherent piece of work that carves out a road-less-traveled for the band in the now crowded roots music genre.